SBI mCash facility allows its SBI account holders to send or transfer money to anyone’s mobile number or email id whether the beneficiary or receiver is SBI customer or not. Just to be able to transfer or send money you will need recipient mobile number or email id and if you have any of these details with you can easily send him or her money using SBI mCash service. Below we have explained step by step method on how to send money to mobile number or email Id via SBI mCash facility without knowing their bank account number. Just login into Online SBI Internet Banking and navigate to Payments/Transfers > State Bank mCASH Send Money or you can even use SBI App. In State Bank mCASH – Send Money screen you will have to enter beneficiary mobile number or email id, amount to be sent, remarks (that’s optional), and lastly accept the Terms and Conditions for usage of State Bank mCASH by marking it and click on submit button. Next you will have to complete the confirmation process by entering the OTP received on your mobile number. 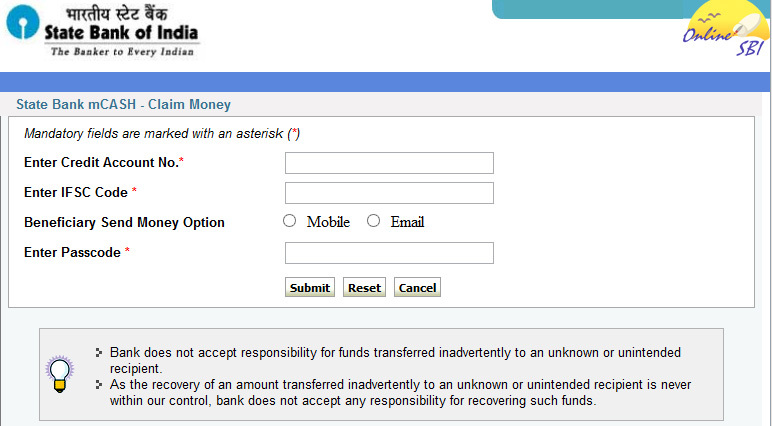 That’s it you are done transferring money to mobile number or email id of the recipient. Transaction limit Rs.1000/- per transaction. However, the maximum limit of fund transfer should not exceed Rs.5000/- in a month, per user. The customer would be charged at Rs.2.50 per request. Redemption is subject to availability of funds in sender’s account at the time of claim. 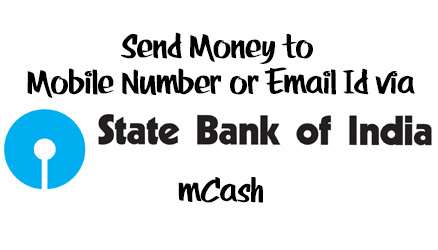 For State Bank mCASH – Send Money Either Beneficiary Mobile Number or Beneficiary Email Id is mandatory. At the beneficiary end, the recipient will need a Bank account it’s not necessary that it should be SBI you can use any claim the funds in any bank account. Once the sender had send the funds to recipient mobile number or email, the recipient will receive a link in the SMS or email based on the medium chosen by the sender. An 8 digit passcode will be provided in the communication which is required to be used on the State Bank mCASH link available on pre-login screen of OnlineSBI or State Bank mCASH mobile App to claim the funds. Beneficiary is required to enter the Account Number, IFS Code, Passcode, Mobile number or Email address in the space provided and funds are transferred “Real time” via fund transfer functionality or IMPS facility for interbank transfers.